Founder of the world’s first impartial robot lawyer Robot Lawyer LISA, Chrissie Lightfoot, is heading to Cape Town to help South African legal professionals prepare for the legal tech age. Lightfoot, a successful UK-based entrepreneur, prominent legal futurist and non-practising solicitor has been a strong advocate of incorporating burgeoning technology in the legal industry but doesn’t back the repeated prediction that human lawyers will become extinct as legal robots take over law firms. She maintains that there will always be a need for human lawyers who possess skills such as empathy, intuition, and emotional intelligence to address the more emotive and sensitive aspects of legal problems. There is no need for legal professionals to be intimidated by legal tech. Instead, the industry should welcome the service offering enhancements, as well as efficiencies and savings technological advancements bring about. Lightfoot is confident that increased adoption of technology will boost job satisfaction, productivity levels, bottom line results, and ultimately loyalty from clients due to better quality service. Not only does AI have the potential to perform routine legal tasks such as contract drafting, legal research or scanning of legal documents, but it also allows human lawyers to focus on tasks they enjoy and to spend time on the legal aspects of a case that requires human intellect, argument and skills. After working with various law firms and LegalTech companies, Lightfoot spotted a gap to use technology in new and innovative ways in the legal market. She developed LISA to serve the up to 90% neglected legal buyer market who cannot access the legal services and attend to their legal problems without legal representation or advice. Today, Robot Lawyer LISA is an easily accessible online self-help service that allows clients to create personalised, legally binding contracts from anywhere in the world, This ground-breaking AI technology acts as the middle man and advises contracting parties on how to build their contract on mutually agreed terms while saving time and legal costs. Individuals and business can address their own legal, only needing to consult with a human lawyer in very complex legal matters. Join the number of legal professionals from around the country who seek a competitive edge or to future proof their careers. 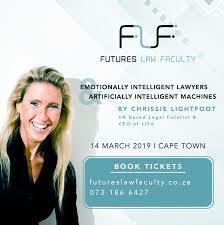 Secure a spot at Chrissie Lightfoot ‘s special Master Session hosted by the Futures Law Faculty on the 14th of March 2019 in Cape Town. – How to market, brand and sell YOU (and your business). The event promises to be motivational, inspirational and even transformational. See the Futures Law Faculty website, http://www.futureslawfaculty.co.za/ for more information and to book your tickets today. Next articleWhen is a debt not a “debt”?